A puzzle game based on the 1998 arcade title Puzz Loop. Coloured marbles move along a twisting path towards a hole. If they reach the hole then the game ends. Using the stylus, fire coloured marbles to match three of the same colour and send the line back. The main Survival Mode is an endless game. In Quest Mode, the player has to clear boards under special conditions. 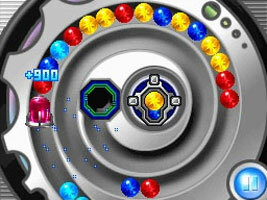 Puzzle Mode requires the player to clear the screen of marbles with a pre-determined set.